If you know anything about industrial pipe insulation, you know that its two biggest benefits are money savings and energy savings. It’s no wonder that these two benefits are always the headliners—the savings really are impressive on both sides. But mechanical insulation plays a much bigger role in the overall health and safety of facilities than simply affecting the bottom line. The qualities below are often the unsung heroes of insulation, valiantly serving their purposes even though they’re underappreciated. These benefits may not be as glamorous as cutting operations costs and reducing greenhouse gases, but for safe, efficient facilities, they’re just as important. Safety is a top concern for any organization, with many facilities employing safety specialists to maintain hazard-free conditions. Insulation isn’t often recognized for its role in keeping staff safe, but it plays a critical part in several different ways. First, mechanical insulation protects employees from thermal burns and related injuries. OSHA considers exposed heated surfaces, if there is a potential for injury, to be a workplace hazard and issues citations if there is a possibility of employees coming into contact with such surfaces. For example, in 2010 Pinnacle Foods Group was given a $2,975 penalty for exposing employees to thermal burn hazards in the form of uninsulated pipes. The steam and hot water pipes, which operated at about 180 degrees Farenheit, were located in multiple prep areas and adjacent to the walking/work surfaces. Insulation also helps prevent pipe leaks, which are another potential danger employees face. Not only does insulation help alleviate the possibility of staff members slipping on moisture that the leaks leave, but it also help stop people or products from being hit with potentially hazardous process materials. Indoor mold growth is a well-known problem for buildings and facilities, but many people don’t recognize the role that insulation plays in preventing mold growth. Because it’s designed to control temperature and moisture, industrial pipe insulation is one of the most powerful tools available for controlling mold. When it’s correctly installed, mechanical insulation creates dry, temperature-controlled conditions that inhibit mold growth. The key here is that the insulation needs to be properly specified and installed. Selecting the correct materials, installing correctly, and keeping additional building systems in mind are all critical to achieving condensation and mold control with insulation. Because of insulation’s role in controlling thermal processes, it makes sense that certain insulations have fire resistance or firestopping qualities as well. Industrial pipe insulation such as fiberglass, mineral wool, etc. can easily be incorporated into a facility’s firestopping plans. If firestopping is a main goal of a facility, an insulation contractor can specify and install a system with that specific goal in mind, adding additional elements such as firestopping sealant or caulk. Note: The fire performance of different pipe insulations can vary greatly, so never assume that any product is a firestop product unless expressly stated. 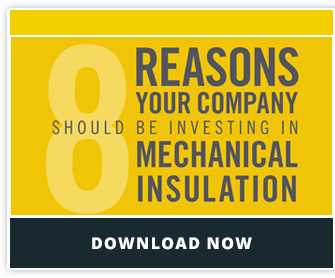 It's time to stop underappreciating these great mechancial insulation benefits!